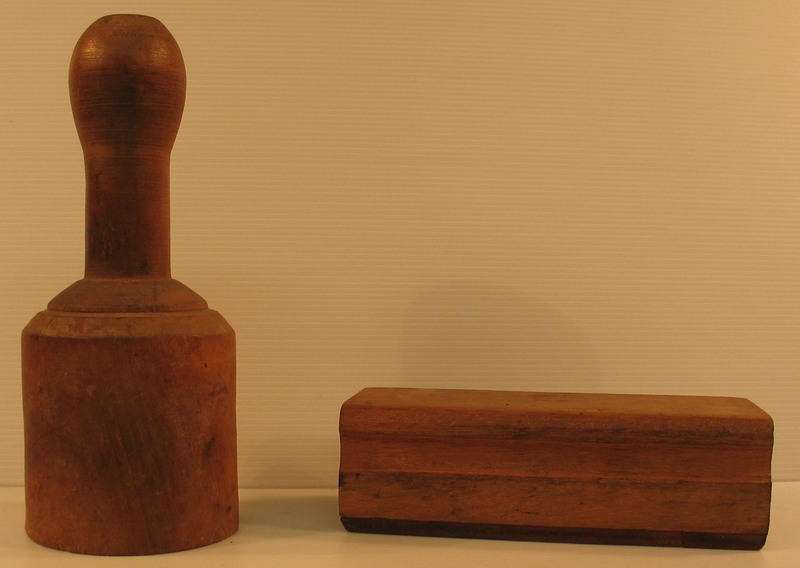 We have two proof planers (or “planing blocks,” one large and one small), and one wooden mallet. These are used in planing type–that is, leveling the type in the form (i.e., the term for set page(s) locked in and ready for printing) to make sure that it is standing on its feet. If one letter is the least bit higher than the others on the bed, it will foul the impression. It is fascinating to me how much precision is required in every aspect of printing. Think of this the next time you blithely press the print icon on your computer–in less than a second, you can accomplish what it took past generations years to produce. 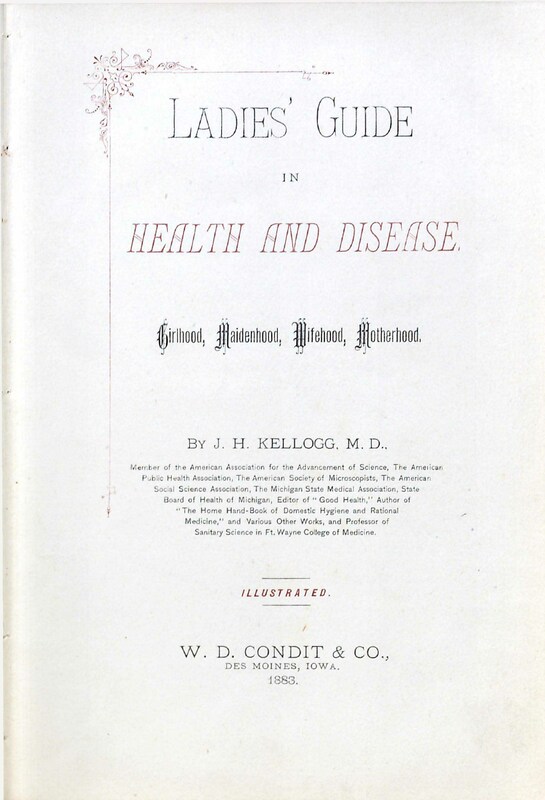 John Harvey Kellogg, of breakfast cereal fame, published this Ladies’ Guide in Health and Disease: Girlhood, Maidenhood, Wifehood, Motherhood in 1896. Kellogg was “famed for promoting vegetarianism, sexual abstinence, and the liberal use of enemas,” and “here offers a straightforward and in some ways highly progressive (for its era) discussion of women’s health at all stages of life, focusing on developing a ‘higher type of womanhood’ (iii), one free from unnecessary invalidism and susceptibility to disease. Kellogg denounces corseting, unsurprisingly, and also condemns the extreme differences in treatment of little boys and girls, which resulted in the latter becoming both mentally and physically but poor shadows of the vibrant women they might have been. Although staunchly opposed to birth control and abortion, he also insists on married women’s freedom from unwanted ‘marital excesses’: of all the rights to which a woman is entitled, that of the custody of her own body is the most indubitable (p. 341)” [PRB&M description]. Comments Off on Eat your Corn Flakes! In the Watkinson we have a copy of Memoir of the Northern Kingdom, by William Jenks, possibly the first American fantasy tale. It appears from its title-page to be a collection of letters written from the Rev. William Jahnsenykes to his son in 1872, and published in 1901 in “Quebeck.” This was actually written by Jenks (1778-1866), and published in Boston in 1808. 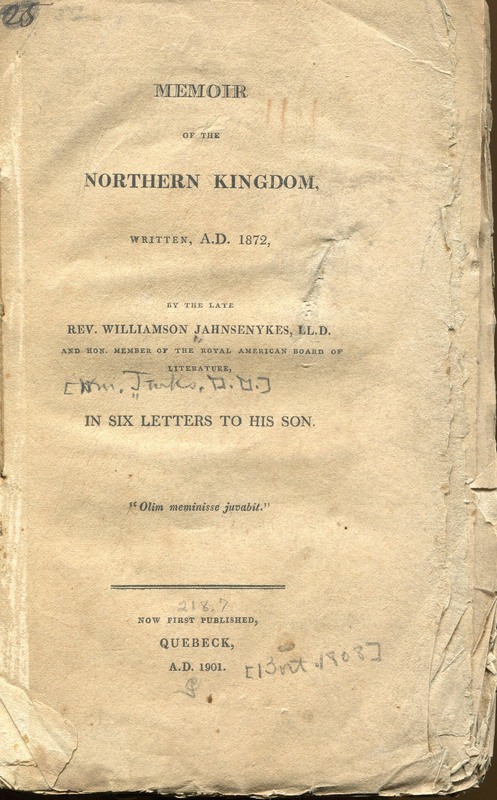 This is a fantasy satire on Jeffersonian politics and a rare example of early American fantastic fiction, cast as an epistolary history, in which the United States has split into three nations: a Northern Kingdom (New England, New York, and Canada) ruled over by an English viceroy (New England joins the Northern Kingdom after a war with Virginia); a francophone Southern slave-holding kingdom ruled by a branch of the Bonapartes; and the Illinois Republick, which alone retains the principles of the American Revolution. We have some nice composing sticks already, but if we do get a real printing club going, we’ll need a few more. 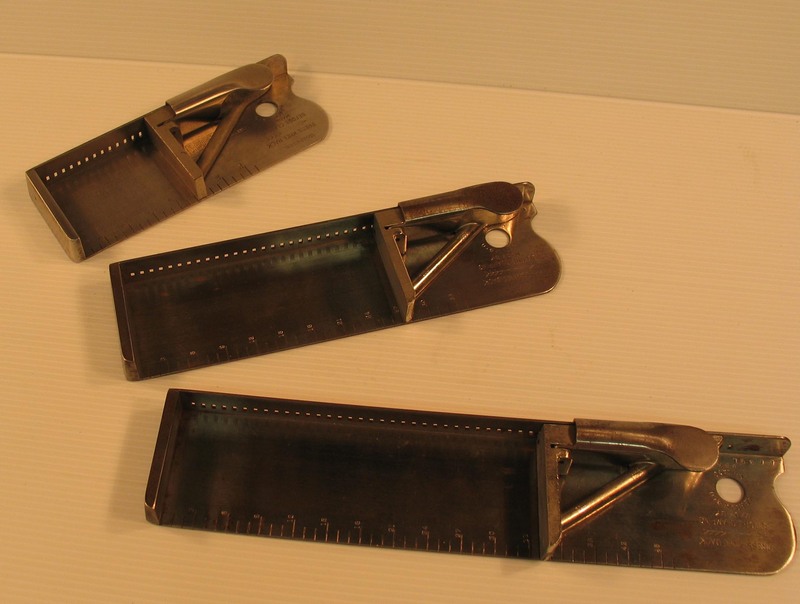 This is a hand-held, three-sided tray in which type is set and justified to a specific measure. Modern sticks are two-sided trays with an adjustable third side called a knee. The types are placed against the long side of the stick. We have three different sized sticks in the Watkinson, shown here. To set type, you stand at the case (the tray of letters, each arranged in little boxes) and set each letter one at a time, backwards. Depending on the font size, you can do several lines before placing them on the press to be locked in. So here is my first post on the equipment we already have in the Watkinson for our little print shop. Thanks to Joe Laws (’12) for his work in organizing and photographing these for the blog! Most of the definitions are taken from Rummonds’ Printing on the Iron Hand Press (1998), but I will not bother with quotes and page references–buy the book if you are that interested! NB: The American Point System, which was adopted in 1886 by the United States Typefounders Association, is the standard in the U.S. and U.K.; it consists of two units of measure: the point and the pica; the point =0.13832 inches (0.351 mm), and one pica = 12 points. Type sizes and their spacing material is given in points; line lengths are measured in pica. You are currently browsing the The Bibliophile's Lair blog archives for March, 2011.